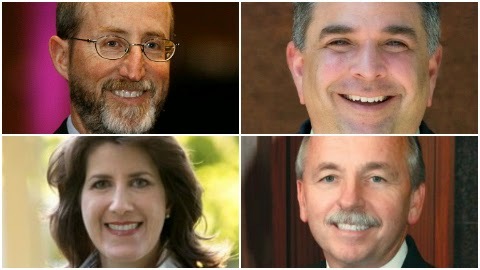 Clockwise from the left: Steve Glazer, Tim Sbranti, Catharine Baker and Newell Arnerich. THE CANDIDATES Before Steve Glazer was the “Ban BART Strikes” guy, he was the mayor of Orinda and Gov. Jerry Brown’s best bud. Now, Glazer is attempting to parlay his early opposition to the BART strikes that roiled the Bay Area during the last half of 2013 into a seat in the State Assembly. Running boldly on a single issue is not easy feat, but Glazer has done a masterful job of stoking the anger, especially in this truly moderate district, that many felt toward public employees last year. Nevermind, a deal to end the strikes was made six months ago, all four candidates in this race are still talking about it everyday…For Glazer’s manipulation of the BART issue to work, he needed a foil and that person became Dublin Mayor Tim Sbranti, also a moderate Democrat like Glazer, but one who is backed by labor unions. Sbranti is a high school teacher who counts Rep. Eric Swalwell as a former pupil. In fact, Sbranti differs with Glazer on few issues, but that doesn’t matter because the most contentious point is BART and on that count they diverge greatly…Republican Catharine Baker is a first time candidate from the Tri Valley who is the race’s genuine conservative. She believes in small government, opposes high-speed rail and water tunnels under the San Joaquin Delta. Baker says it was her, not Glazer, who first took on the issue of public employee transportation strikes…Newell Arnerich is the mayor of Danville, who like Glazer and Baker, opposes BART strikes. However, in public forums and an endorsement meeting with the Bay Area News Group, Arnerich often jousts with Glazer, more than Sbranti or Baker. MAIN BEEF BART, BART, BART. This race is all about BART, which would seem to favor Glazer, the candidate who has made it his signature issue, but not necessarily. In fact, Baker may be the unintended benefactor of the Glazer/Sbranti war that has attracted closed to $3 million in independent expenditure committee money to the race. It remains to be seen whether a flurry of mailers from pro-Sbranti labor IEs saying Glazer is a flip-flopper who claims to be an independent Democrat at the same time he is a fiscal conservative might induce right-of-center voters to the genuine Republican in Baker. Pundits says yes and have recently vaulted Baker to the top of the pack. However, there is absolutely no consensus over who finishes second. The group of six East Bay Citizen political experts used to determine the predicted order of finish in all races wouldn’t even venture a guess. QUOTABLE “Republicans, put an effective fiscal conservative in the State Assembly. Vote for Steve Glazer,” said a recent mailer sent by Glazer’s campaign to AD16 conservatives. BY THE NUMBERS Voter Registration: Democratic 39.7%; Republican 32.4%; No Party Preference 21.5%. Campaign Finance, cash on hand through May 17: Glazer $354,057; Baker $192,381; Sbranti $64,833; Arnerich $20,692. 2012 Primary Result: Joan Buchanan (D) 56.7%; Al Phillips (R) 43.3%. ON TO NOVEMBER Catherine Baker is a real find for the local Republican Party. No matter who Baker faces in November, its going to be a very difficult race for any of the competitors, but Baker has shown to be a confident and thoughtful candidate. Which special interests-backed opponent poses the greatest threat to her candidacy is unclear. Judging by the sheer amount money and desperation shown by labor unions, you can venture to guess it would be Sbranti. In addition, the State Democratic Party simply cannot afford to lose another winnable seat in the Legislature. Conversely, Baker vs. Glazer in November is favorable to the Republican, assuming moderate primary voters who might lead her to the top spot on June 3 already made their choice based up the very same matchup. 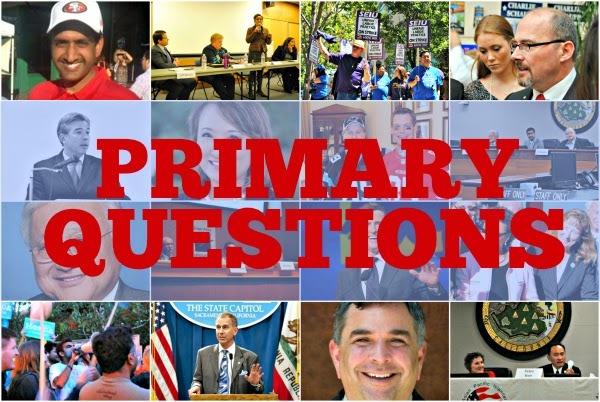 Posted in AD16, Assembly, BART, Bart strike, Catharine Baker, independent expenditure committees, June primary, moderates, Newell Arnerich, primary questions, Republicans, Steve Glazer, Tim Sbranti. Bookmark the permalink. The corporate independent expenditures have now gone over 2 million for glazer.I voted for Tim Sbranti because I would rather have a teacher in the assembly seat who knows how to compromise and get things done, than a corporate shill who has no ability to reach compromise or understand both sides of an issue. Who knew? On want issue is he a moderate? Our family voted for Mr. Glazer. Our family voted for Baker. Tired of all the hit mail pieces between Sbranti and Glazer. That's NOT what we need in Sacramento. BTW, 1 week before Glazer came out against BART striking, he was totally noncommittal on the BART strike and came out against it only after realizing how angry the citizens were and that it could be a campaign issue for him. Very two-faced if you ask me!! Again not what we need in Sacramento!! Steve Glazer is a political consultant who was paid hundreds of thousands of dollars by a corporate interest group funded by tobacco companies, oil companies, real estate developers, pharmaceutical and insurance companies. If elected to to the state legislature Glazer would work to pass laws that benefit them and rubber stamp their issues. Tim Sbranti in contrast, is a statewide leader in education, a classroom teacher and effective local leader. Under his fiscal leadership he transformed Dublin from a city suffering from serious budget deficits into a city with a budget surplus, without sacrificing major cuts to community services. Most of us will be supporting Tim Sbranti. He is one who works towards compromise and has the support of moderates, independents, democrats, consumers, police, fire, nurses, teachers, environmentalists, seniors, women, and others who care about multiple issues that matter to voters and not just one issue like your candidate. We went with CLEAN STEVE GLAZER 2014! That guy Branti is bought and paid for by the corrupt special interest union whores. He's the dirty unions choice in 2014! Why the hell would anyone put that crooked fox in the hen house? He'll bankrupt CA and give it all away to the union whores, who are supporting him and continue screwing the rest of us. That's why my family voted for CLEAN STEVE GLAZER 2014. Steve has done amazing things in his city to bring people together on issues, rather than tear them apart like Branti. That's why Steve is supported by just about all the consumer groups, senior groups, environmental groups, etc. Please for the love of god, who are the six “experts” you consult? Don't need to tell us their predictions just identities. Most of my neighbors will be supporting Tim Sbranti. He is one who works towards compromise and has the support of moderates, independents, democrats, consumers, police, fire, nurses, teachers, environmentalists, seniors, women, and others who care about multiple issues that matter to voters and not just one issue like your candidate. If you look at Tim Sbranti's website you will see the large number of diverse groups that are endorsing Tim. They are not just unions, but consumers, seniors, environmentalists, youth, women, conservatives, moderates, and independents. Your candidate by contrast, has gotten most of his money from corporate interest groups who want to stick it to the middle and lower classes. Looks like Tim is the people's choice in 2014, although your candidate sure has sexist support as proved by your posts. We believe that teachers belong in the classroom. To that end, we will be voting for clean STEVE GLAZER 2014. The future assemblyman knows that, too. We all need to send Steve to Sacramento and his opponent back to the classroom, where he belongs. Teachers have no business in the capital; that's the place for qualified legislators. Teachers belong in the classroom, implementing the policy that the qualified legislators have passed. Let's all do our part by supporting clean STEVE GLAZER 2014! He's the PEOPLE'S CHOICE candidate! Joan Buchanan will back Tim Sbranti who will be our next Assemblyman. This with the teachers providing walkers and phoners will be more than enough for Tim to win the primary and the General. The Contra Costa and Alameda Labor Councils will also back Sbranti. The conservatives and Republicans will be backing the only woman in the race-Baker. This leaves Glazer 3rd at best. Politics of the top 2 screws him. Besides, Tim has the ability to bring everyone together to create compromise where everyone wins. No one else does. Steve Glazer is not clean. He has been bought and paid for by the corrupt corporate special interest crooks that continually stick it to consumers. They have spent over two million dollars on his campaign. If you haven't voted already go to Tim Sbranti.com—Tim is the people's choice! I see the the shill is trying to directly link oil and tobacco companies to Glazer, rather than being paid as a consultant by JobsPAC. If you only would have gone 1-2 degrees further – you could say Glazer tax dollars are paying public unions – which are funding Sbranti's war chest. So you see, oil & tobacco are funding Sbranti's campaign! Of course, I don't see any effort to dig into Sbranti's political donation history before he became the unions' darling. If the shill did, he might have mentioned Sbranti's donations from PG&E and 3 donations from Chevron. The shill might have even mentioned the disgusting push polling tactics supporters of Sbranti are conducting in AD16 – a race & class baiting tactic straight out of the Republican playbook on how to manipulate low information voters in southern states. Now let's see how well that tactic works in AD16 – with Orinda, Lafayette, Moraga, Walnut Creek, Alamo, Danville, Blackhawk, San Ramon, Dublin, Pleasanton and Livermore – the voters are not exactly low-information, and might actually care about where their tax dollars go. Oh, and it's only odd that the author did not mention any of this with the assumption the shill himself did in fact write this hit piece and not the Sbranti campaign – which in that case its totally understandable! I see the glazer shill/ troll is still posting. Steve Glazer is not clean. He has been bought and paid for by the corrupt corporate special interest crooks that continually stick it to consumers. They have spent over two million dollars on his campaign. Tim won because being anti union won't win in the Bay Area. Take the Glazer, you corporate shill.